Last edited by monrad on 20 Feb 2005 17:08, edited 3 times in total. Do you know if at panzer museum in Munster are looking for a caretaker ? more now that the afvinteriors.com site has been offline indifenitively due to the amount of traffic. Last edited by monrad on 20 Feb 2005 17:08, edited 1 time in total. Those guys sure get up ti some mischeif, crawling all over/under the KingTiger Those are some awesome pics, thanks for sharing. Darn i'd like seing this beast in reel, any tiger I and II I could visit in Canada? Last edited by monrad on 20 Feb 2005 17:09, edited 1 time in total. The closest place where I could see Tigers would be in Russia....Hmm.. 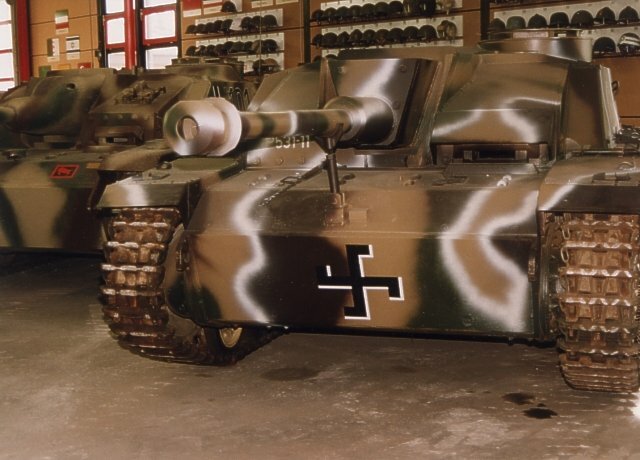 The only German AFVs Finnish museums have are StuG IIIG and Panzer IVJ. By the way, that StuG IIIG next to Tiger II used to belong to Finnish Army. I have NO idea how the Germans managed to make up such a horrible colour-scheme! Where did they get that big swastiska from? closest you'l get to german armor that i've seen in canada is on base borden near barrie where there's some PAKs and a PAnther. Do you know what are average conditions of the tank ? Ace, there is only one Tiger II in the world that is still in running conditition.